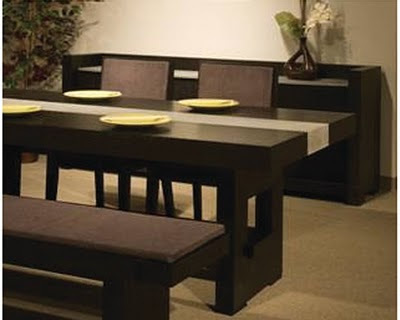 The clean lines and dark tones of this table make it a beautiful piece but its sustainability makes it a stand out one. The table top is an eco-stone inlay on a walnut veneer base. Add to that a unique seating option like this bench across from 2 coordinating chairs, make this dining choice good for entertaining as well as for the environment. This table is made beautifully. The mill work of the wood, combined with the stone inlay create a truly rich, contemporary feel.